*Any coupon codes or bulk buy discounts will not work on any Optifast products as we supply these products with the primary objective of making the products available to more people, and therefore there is only a slight mark-up from market price. Optifast VLDC desserts provide a nutritionally complete, delicious alternative to the regular Optifast shakes. These mousse styled desserts are available in two delicious flavours including chocolate and lemon crème flavours which can be consumed at either breakfast lunch or dinner. The Optifast desserts are high in protein and contains adequate fibre. This product takes under 10 minutes to prepare because it requires refrigeration for approximately 5 minutes to ensure a firm consistency. If you are wanting a lifestyle change to increase energy, activity, health and wellbeing, the Optifast program is for you! What is the Optifast VLCD Program? The Optifast program provides a holistic approach to weight management where you are provided with all the support and education you require for weight loss and ensuring optimal health and wellbeing. This will assist you in making lifestyle changes which will maintain a healthy weight. The Optifast program has been researched extensively to enhance success rate and safety for all patients. It includes a flexible program which provides recipes and advice on living a healthy lifestyle. The fundamental role of Optifast is to assist with weight management, promote optimal health and provide education regarding healthy living. In the Optifast program, all regular meals are replaced with Optifast product which restrict calorie intake whilst ensuring optimal health and wellbeing. A reduction in caloric intake below 800 calories per day results in the body utilising energy form its own fat stores rather than food. Research has identified that very low calorie diets enhance initial weight loss potential than other diets, estimated at 9-26kg over 4-20 weeks. The efficiency of the program may increase with the implementation of an adequate exercise program. In the initial stages of the Optifast program, it completely replaces regular dietary intake. As weight loss initiates, normal everyday meals can be progressively re-introduced. These products contain high quality protein, essential fatty acids and carbohydrates. The products also include the essential nutrients, minerals, trace elements the body requires to maintain optimal health and wellbeing. The Optifast program consists of four stages which include the intensive phase, transition phase, maintenance phase and the stabilization phase. Intensive Phase: This is the initial phase which replaces all meals and is consumed conjunction with 2 cups of low starch, green vegetables, 2 serves of fruit, 1 serve of dairy and 2 litres of water per day. Transition Phase: One low calorie meal is introduced into the diet (approximately 300-350 calories), in combination with 2 cups of low starch vegetables, 2 serves of fruit, 1 serve of dairy and 2 litres of water per day. Maintenance Phase: At this phase of the program, Optifast replaces one meal a day in combination with two low calorie meals (approximately 300-350 calories each), 2 cups of low starch vegetables, 2 serves of fruit, 1 serve of dairy and 2 litres of water per day. Stabilization Phase: Once weight loss has been accomplished, you no longer require Optifast if you are consuming a healthy diet below 1500 to ensure you are still achieving your weight loss goals. Very Low Calorie Diets (VLCD’s) should only be implemented where rapid weight loss is required for optimal health and wellbeing with the recommendation and supervision of medical professionals. This product is unsuitable for use by pregnant or lactating women, infants, children, adolescents and the elderly. 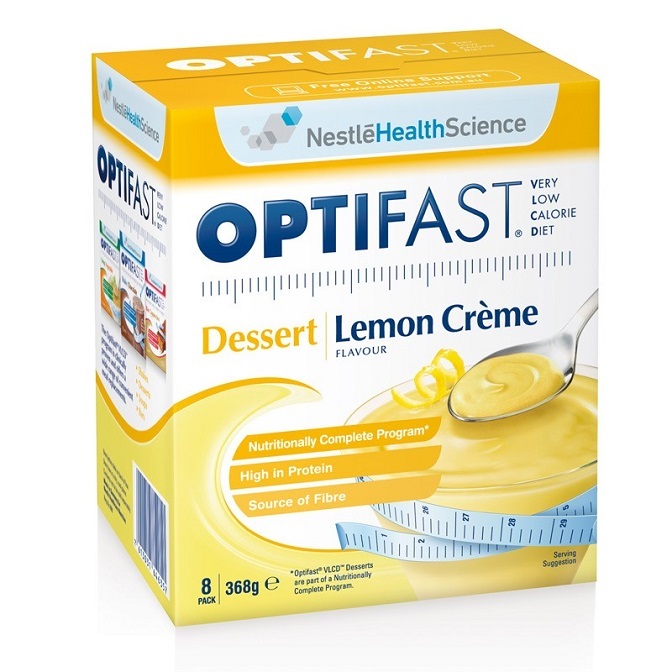 Optifast desserts are extremely simple to use. All you need to do is add one sachet of Optifast dessert to 200ml of cold water and vigorously mix using either a shaker, fork or whisk. Leave to set covered in the refrigerator for approximately 5 minutes. Should be used within 24 hours of mixing.